At Seward County Community College, connecting with the heritage of Hispanic students is a given, and Cinco de Mayo is no exception. This year, the traditional Mexican holiday — May 5 — occurs on the same day as the college’s commencement ceremonies. Rather than viewing the overlapping date as a challenge, SCCC opted to join the celebration, with a Mexican-music twist on the traditional after-graduation reception on the campus green. For the second year in a row, folkloric dance group Ballet Folklórico Omawari will perform in the SCCC amphitheater during the outdoor reception following commencement. SCCC is a Hispanic Serving Institution, or HSI, as designated by the federal government, which requires a student enrollment that is at least 25 percent Hispanic. At 50 percent, Seward’s numbers are double that, noted Vice President of Student Services Celeste Donovan. Ballet Folklorico Omawari is made up of engineering students from the Technological Institute of Delicias (ITDel). The group of more than 20 performers is known across Mexico for presentations of multiple traditional dance styles. The date of Mexico’s victory over France in the Battle of Puebla in 1862 is listed right in the holiday’s name, May 5. But the majority of local observation of the festivities will occur May 6, in order to accommodate SCCC’s commencement, as well as the GED graduation ceremonies scheduled for 3 p.m. Saturday on the SCCC campus. Saturday evening, 12 contestants, several of them SCCC students or graduates, will compete for the Miss Cinco de Mayo crown. That event, organized by Cinco de Mayo chair and SCCC student advisor Janeth Vazquez, is set to begin at 7 p.m. at the LHS James Maskus Auditorium. 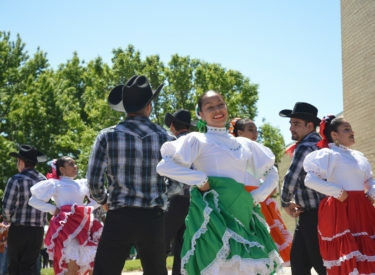 Sunday, Ballet Folklórico Omawari will perform for the public at the activity center, following the 2 p.m. Cinco de Mayo parade on Kansas Avenue.